A deep garnet core with a deep crimson rim. I was never convinced about this wine when I tasted it at en primeur and contrasted against its contemporaries in this horizontal, its deficiencies are all too visible. Moderate intensity on the nose, open and expressive with notes of black fruits, wild hedgerow, pencil lead, dried leaves, roasted herbs, perhaps lacking the freshness and vigour of say Haut Brion 1998. 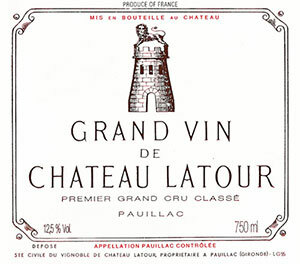 The palate is medium-bodied, very harmonious and surprisingly fleshy for Latour, with rounded supple tannins, a certain lushness that you infrequently find here, a touch of spice on the finish. But it lacks the tautness, the tension, the depth and grip of a truly great Latour and against Haut Brion, it shows like the bantamweight of First Growths, a bantamweight Latour? Approach with caution in 2-3 years. Tasted March 2008.